TOKYO – The European Union’s top officials arrive in Japan Tuesday to sign the single market’s biggest trade deal ever and present a united front as Washington upends the international trade order. 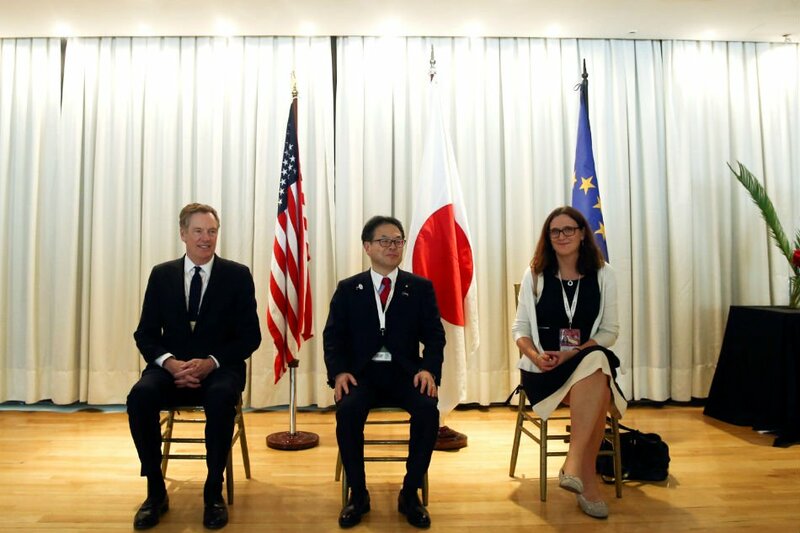 EU and Japanese officials say the deal demonstrates their commitment to lowering trade barriers even as US President Donald Trump pushes his protectionist “America First” policy. Trump has unsettled America’s allies and provoked the ire of its rivals with bombastic statements, hefty trade tariffs, and threats of a trade war. EU Council President Donald Tusk and Commission head Jean-Claude Juncker land in Japan Tuesday after talks in Beijing, where they urged calm instead of “conflict” in international trade. The “landmark” EU-Japan deal creates a massive economic zone and stands in stark contrast to Trump’s protectionism. Agreed last December, the deal is “the biggest ever negotiated by the European Union,” according to Commission spokesman Margaritis Schinas. “At a time when protectionist measures are gaining steam globally, the signing of the Japan-EU deal today will show the world once again our unwavering political will to promote free trade,” Japan’s minister for economic revitalisation Toshimitsu Motegi said Tuesday. On Sunday, the US president fuelled rising rancor by labelling the EU, along with Russia and China, “a foe” of the United States, and repeating his assertion that the EU has “really taken advantage of us on trade”. EU officials and Japan will also look to present a united front against US tariffs on steel and aluminium, which Tokyo has called “deplorable”. Junichi Sugawara, a senior research officer at Mizuho Research Institute, said Trump’s protectionism had “prompted Japan and the EU to speed up negotiations on the deal”. Japan’s Prime Minister Shinzo Abe “has good relations with Trump, but in terms of trade, Japan has sided with the EU,” he said. Talks last year closed the gap on most remaining issues between the two sides, but a dispute resolution mechanism remains to be negotiated.